Is Kobe's Knee Ready for the NBA Season? The Lakers soft schedule to start the season makes Kobe's knee less of a concern. PHOENIX - MAY 29: Kobe Bryant #24 of the Los Angeles Lakers reacts to a play in the fourth quarter of Game Six of the Western Conference Finals against the Phoenix Suns during the 2010 NBA Playoffs at US Airways Center on May 29, 2010 in Phoenix, Arizona. Tuesday night just after 7:30, Kobe Bryant will accept his ring, take off his sweats and play 35 minutes or so. You can bank on it. How effective will he be? That's another question entirely. Kobe's knee isn't right yet, after an offseason surgery to clean out scar tissue. It's obvious and obviously bothering him. In the preseason, he shot 28 percent overall, 17 percent from three. In the Lakers final preseason game he was 6-19 from the field, 4 of 14 from beyond 16 feet and 2-9 from three (and when he is shooting a lot of threes it means he's settling, not attacking). 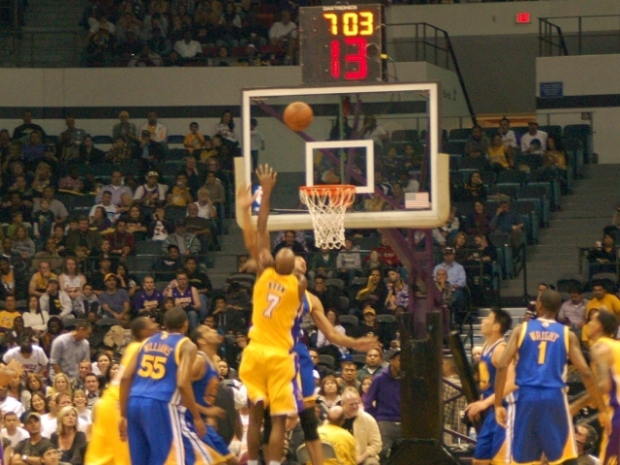 Kobe's shot starts with his legs (as it should, that's just good fundamentals). When his shot is off, it is usually when he is not getting good elevation to shoot. Not that Kobe will admit it. Some variation of "it's good" was his only response to reporters Sunday. He told Dan Patrick on his radio show Monday that he was close to being 100 percent -- and that might be the first time he felt that way "since he had facial hair." It's hard to take Kobe at his word with injuries, since he treats them like the Black Knight from Monty Python. Andrew Bynum is a little easier to read -- he's likely out until Thanksgiving, maybe later. But the Lakers are used to playing without Bynum, they can get inside points from Pau Gasol and be just fine. Kobe is a different story. He is the first option in the offense, the threat as the clock winds down. The Lakers triangle offense is predicated on balance -- spacing the floor and having each guy understanding that spacing. What makes it work is Kobe -- you have to unbalance your defense to stop him, or he will go 81 on you. He might anyway. But once you unbalance yourself, the other Lakers can make you pay. If Kobe is not Kobe, if you can guard him with one man, the Lakers can be stopped. When will Kobe be right? When will the Laker offense return to normal? Hard to say, because Kobe will keep walking out in the court, Phil Jackson will keep playing him big minutes and nobody else will talk about it. It's not that bad, Lakers fans, and here's why -- the Lakers have a soft start to the season, 20 of the first 28 are against non-playoff teams from last season. It really isn't until Christmas and the following six weeks or so when the schedule for them is tough. Kobe should be right by then (if not, the Lakers problems are far more serious). For now, it's just Kobe being Kobe. Injured or not. And the Lakers likely winning a lot. Kurt Helin lives in Long Beach and is the Blogger-in-Chief of NBC's NBA blog Pro Basketball Talk (which you can also follow in twitter).